Georgia Sports Blog: JJ Green to Tech? I doesn't surprise me UGA has granted JJ Green his unconditional release. I hope he goes on and does great things where ever he ends up....except he is reportedly transferring to Tech. He ran the option as an A-back in HS, so Tech is actually a good fit for him. But remember Tech denied UGA's request to talk to Robert Carter, a basketball transfer. 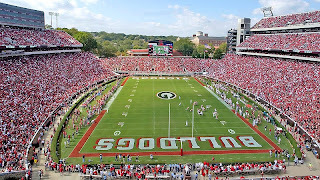 I hope JJ chooses wisely, because I'd have a hard time advising a kid to go to a program that views their athletes as property to toy with Georgia the way Tech obviously does.